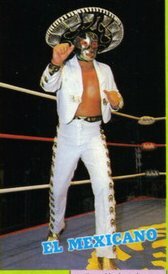 Early AAA wrestler, who used both the Halcon 78 and Mexicano name until going in semi-retirement around 2000. May now work in AAA's office. Still occasionally appears, but the more recent Mexicano on AAA live events might have been Amnesia. This page was last edited on 26 March 2018, at 19:36.